I have always been an athlete, participating in too many sports to name since I was a child, but NEVER a runner! During elementary and middle school I dreaded the timed mile. Just thinking about it would give me anxiety and I was always too embarrassed to repeat my time to anyone. When I got to high school, we had to complete the mile within a certain time to make the varsity volleyball team. Although my spot was secure, I ran under pressure chasing a captain position and leadership role. My teammate and best friend, Mollie, shared the same fear and would go on practice runs around town with me. Mollie runs full marathons now- which is inspiring! I don't have the desire to tackle a full just yet, but maybe someday. I ran my first race in July of 2014 with, Fara, my best friend from college. We ran the Big10K in Chicago as proud Spartans (a race for people who attended Big Ten universities). It was at Michigan State where I began to truly enjoy running. Fara and I would wake up and lift weights in the exercise room of our apartment complex before class. We would blast music and get a good sweat in at 6 o'clock in the morning. Then often run through the beautiful streets of East Lansing in the afternoon. Encouraging each other everyday. Exactly one year after my 10K, I was accepted into the lottery for the Nike Women's Half Marathon in San Francisco. I took this race very seriously. My only goal was to finish without stopping to walk. Which to me, is not easy on any course- let alone through the hills of the Bay Area. Some of those hills are even scary to drive on because of the steepness. So, I downloaded the Nike running app, surrounded myself with runners and athletes, ate clean, gave up drinking alcohol and read a lot of inspirational books. Just as my long distance runs were becoming enjoyable and almost easy, my brother decided to get involved in my training. I was eight weeks into my 12 week program when Ray and I started running the biggest hill in our neighborhood. He pushed me like no other. He yelled for me to speed up and stay at his pace. He had us circle around and run the hill over and over again to the point where I mentally broke down one day and needed to stop. I could not thank Ray enough for forcing me out of my comfort zone and for the next two weeks I woke up every morning and ran that hill five times before breakfast. At that time, I also added swimming laps to my workout regimen which consisted of running, cross training, yoga and pilates. I did all that I could to prepare and by the time of the race, I felt ready. Nervous, but ready. Being in San Francisco the weekend of the race was incredible. 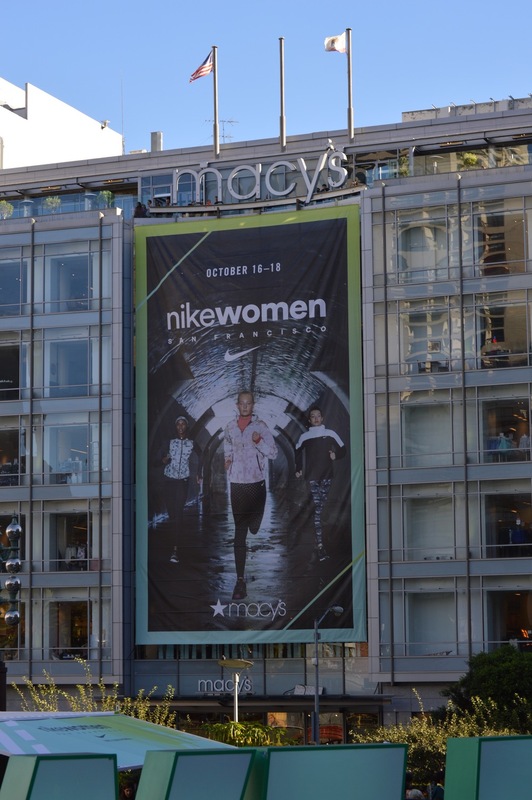 Nike completely took over the city. 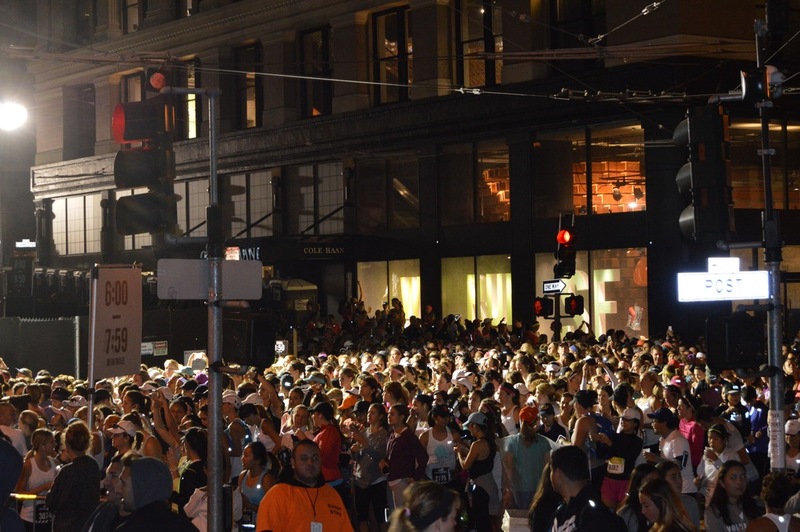 More than 25,000 runners walked the streets sporting their best Nike gear. There was a scavenger hunt that took you all over downtown collecting commemorative earrings- which of course I was determined to complete. At each location was an interactive demonstration highlighting different Nike products. Not only did I get ton of information about the brand, I was able to meet some cool women. Every person had a different story. My mom flew in to support me from Michigan and I insisted we eat Thai food the night before. Since I am a vegetarian, I got my protein from tofu and "carb loaded" on brown rice. Then I made her turn off the lights and let me sleep as much as possible. I was up at 4am foam rolling and using the bathroom to completely empty my bladder. I wanted absolutely no reason to stop along the course. The views were beautiful and I could not ask for better weather. My playlist was amazing. I love music of all genres and listened to a large mix of songs during the race. Sometimes when I run, I get so into my music that I find myself singing out loud. It's all part of my runners high and I was definitely on cloud nine along those 13.1 miles. There were parts of the race where I felt so good I caught myself smiling then other parts that felt like death and I wanted nothing more than to see the finish line. I live for experiences like this! In the end I accomplished my goal- I did not stop! Not once! And walked away with a feeling that is indescribable. At the finish line, every runner received a necklace from Tiffany's & Co. I wear mine everyday as a symbol of my strength. When I'm faced with obstacles, I grab my neckless and remind myself that because I completed that race, I can handle any difficult situation that comes my way.